Nikita Khrushchev (1894-1971) led the Soviet Union during the height of the Cold War, serving as premier from 1958 to 1964. 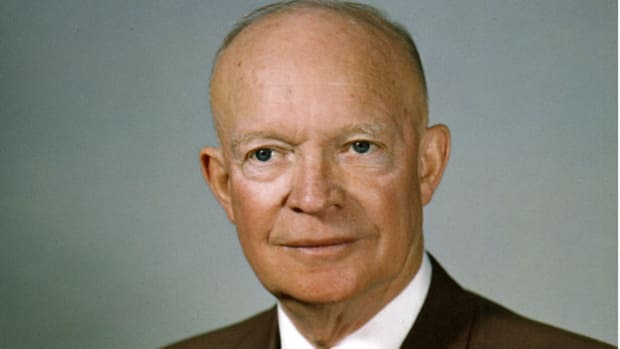 Though he largely pursued a policy of peaceful coexistence with the West, the Cuban Missile Crisis began after he positioned nuclear weapons 90 miles from Florida. At home, he initiated a process of “de-Stalinization” that made Soviet society less repressive. Yet Khrushchev could be authoritarian in his own right, crushing a revolt in Hungary and approving the construction of the Berlin Wall. Known for his colorful speeches, he once took off and brandished his shoe at the United Nations. Khrushchev was born on April 15, 1894, in Kalinovka, a small Russian village near the Ukrainian border. At age 14 he moved with his family to the Ukrainian mining town of Yuzovka, where he apprenticed as a metalworker and performed other odd jobs. Despite his religious upbringing, Khrushchev joined the communist Bolsheviks in 1918, more than a year after they had seized power in the Russian Revolution. During the subsequent Russian Civil War, Khrushchev’s first wife, with whom he had two children, died of typhus. He later remarried and had four more children. In 1929 Khrushchev moved to Moscow, where he steadily rose through the Communist Party ranks. Eventually he entered the inner circle of Soviet dictator Joseph Stalin, who by that time had consolidated control over the country and instituted a bloody purge of perceived enemies. Millions of people were killed or imprisoned in Gulag labor camps, and millions more died in famines brought on by the forced collectivization of agriculture. During World War II, Khrushchev mobilized troops to fight Nazi Germany in the Ukraine and at Stalingrad. After the war, he helped to rebuild the devastated countryside while simultaneously stifling Ukrainian nationalist dissent. By the time Stalin died in March 1953, Khrushchev had positioned himself as a possible successor. Six months later, he became head of the Communist Party and one of the most powerful people in the USSR. 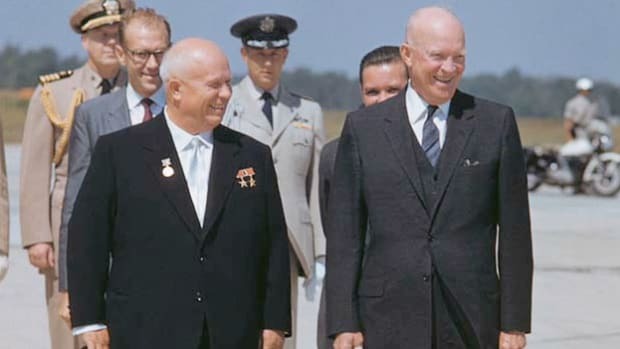 At first, Khrushchev and other high-ranking officials ruled through a form of collective leadership. But in 1955 he organized the ouster of Premier Georgi Malenkov and replaced him with an ally, Nikolai Bulganin. Khrushchev foiled a Malenkov-led coup attempt in June 1957 and took over the premiership the following March. Once a loyal Stalinist, Khrushchev gave a long speech in February 1956 that criticized Stalin for arresting and deporting opponents, for elevating himself above the party and for incompetent wartime leadership, among other things. This withering, albeit incomplete, indictment of Stalin was supposed to remain secret. By that June, however, the U.S. State Department had published the complete text. Starting in 1957, Khrushchev made some minor attempts to rehabilitate Stalin’s image. But he switched course once again in 1961, when the city of Stalingrad was renamed and Stalin’s remains were removed from Lenin’s mausoleum in Moscow’s Red Square. Emboldened by Khrushchev’s so-called “secret speech,” protestors took to the streets in the Soviet satellites of Poland and Hungary. The Polish revolt was resolved fairly peacefully, but the Hungarian revolt was violently suppressed with troops and tanks. In all, at least 2,500 Hungarians were killed in late 1956, and about 13,000 were wounded. Many more fled to the West, and others were arrested or deported. On the domestic front, Khrushchev worked—not always successfully—to increase agricultural production and raise living standards. He also reduced the power of the Soviet Union’s feared secret police, released many political prisoners, relaxed artistic censorship, opened up more of the country to foreign visitors and inaugurated the space age in 1957 with the launch of the satellite Sputnik. Two years later, a Soviet rocket hit the moon, and in 1961 Soviet astronaut Yuri A. Gagarin became the first man in space. Khrushchev had a complicated relationship with the West. A fervent believer in communism, he nonetheless preferred peaceful coexistence with capitalist countries. Unlike Stalin, he even visited the United States. 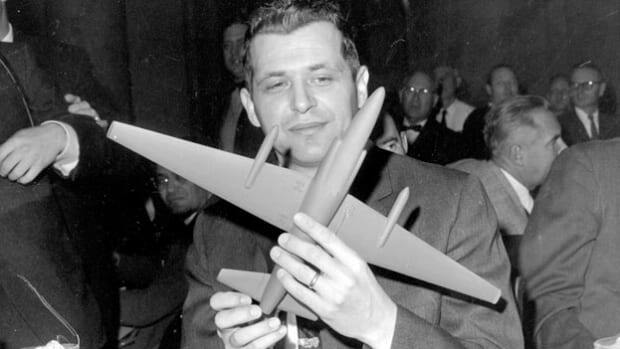 Relations between the two superpowers deteriorated somewhat in 1960 when the Soviets shot down an American U-2 spy plane deep inside their territory. The following year, Khrushchev approved the construction of the Berlin Wall in order to stop East Germans from fleeing to capitalist West Germany. Cold War tensions reached a high point in October 1962 when the United States discovered Soviet nuclear missiles stationed in Cuba. The world appeared to be on the brink of nuclear conflict, but, after a 13-day standoff, Khrushchev agreed to remove the weapons. 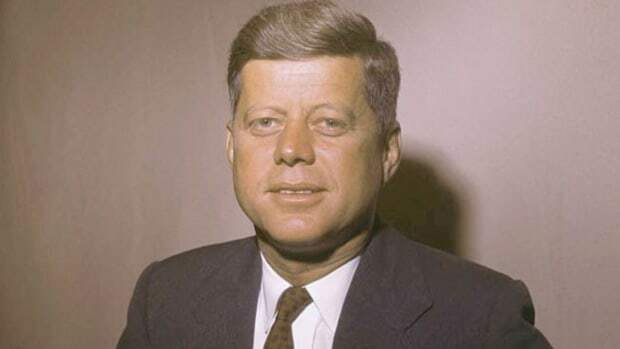 In return, U.S. President John F. Kennedy, who one year earlier had authorized the failed Bay of Pigs invasion, publicly consented not to attack Cuba. Kennedy also privately agreed to take American nuclear weapons out of Turkey. In July 1963, the United States, the United Kingdom and the Soviet Union negotiated a partial nuclear test ban. One of the sharpest thorns in Khrushchev’s side was fellow communist Mao Zedong, the leader of China. Starting around 1960, the two sides engaged in an increasingly vindictive war of words, with Khrushchev calling Mao a “left revisionist” who failed to comprehend modern warfare. The Chinese, meanwhile, criticized Khrushchev as a “psalm-singing buffoon” who underestimated the nature of Western imperialism. The break with China and food shortages in the USSR eroded Khrushchev’s legitimacy in the eyes of other high-ranking Soviet officials, who were already bothered by what they saw as his erratic tendency to undercut their authority. 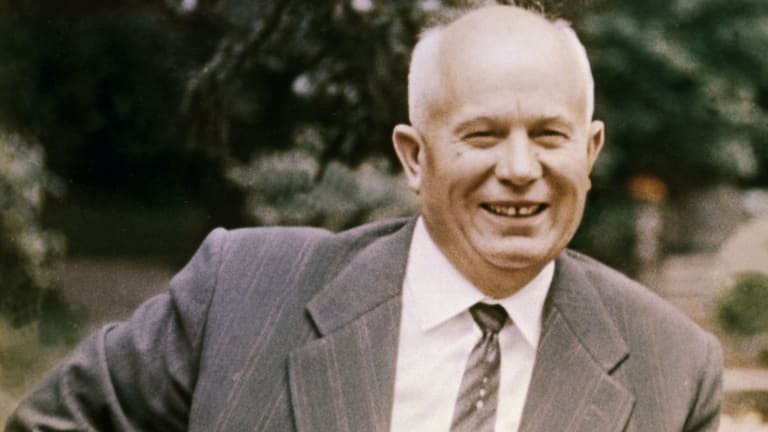 In October 1964 Khrushchev was called back from a vacation in Pitsunda, Georgia, and forced to resign as both premier and head of the Communist Party. Khrushchev wrote his memoirs and quietly lived out the remainder of his days before dying of a heart attack in September 1971. Nonetheless, his spirit of reform lived on during the perestroika era of the 1980s.